As a new mum, there's nothing more important than the health and nutritional wellbeing of your baby. Looking after your child's nutritional intake when they are young can help safeguard their long term health. From the makers of Pregnacare, Wellbaby Multi-vitamin Drops is ideal for babies from 4 to 12 months and provides a safe and balanced comprehensive range of 16 nutrients, including essential vitamins and minerals. 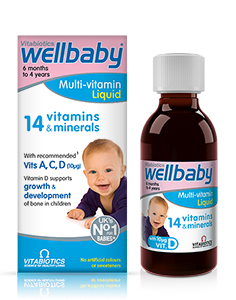 Wellbaby Multi-vitamin Drops has been produced with a baby's special needs in mind to offer a carefully formulated nutritional safeguard during a time when babies have a high nutrient requirement in relation to body size. This can help to support their rapid physical growth and development of bones, muscles, blood and the brain. Wellbaby Multi-vitamin Drops includes vitamin A, C and D.
†Unless they are drinking 500ml (or approx. 1 pint) of infant formula a day, as infant formula has vitamins added to it. Wellbaby Multi-vitamin Drops tastes delicious and also contains Swiss Alpine Malt as a natural energy source; making it a great taste your little baby will love. A measuring syringe is also included making it easier for you to safely administer the drops onto your baby's tongue ideally just before you do a feed. Brain development allows a child to develop the abilities to crawl, speak, eat, laugh and walk. Certain nutrients can help support this development such as iron which contributes to normal cognitive development of children. Once on solid food, vegetarian babies can sometimes be low in iron, as iron from non-meat sources is not as easily absorbed by the body. 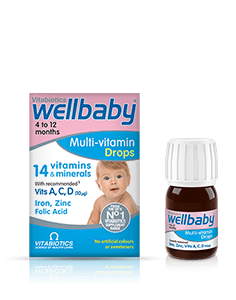 Wellbaby Multi-vitamin Drops is suitable for vegetarian babies so is an ideal way of helping to ensure your developing baby receives enough iron. A baby is born with 300 bones and during the first year of life your baby's bones are growing rapidly. Wellbaby Multi-vitamin Drops includes 10 mcg vitamin D3 (the body's preferred form of Vitamin D). Vitamin D is needed for normal growth and development of bones in children. It also contributes to their normal immune system function. Its formula is based on the very latest scientific research, with nutrient levels carefully selected for the specific needs of growing babies. Wellbaby Multi-vitamin Drops is produced to high pharmaceutical standards of quality control. Does not contain any artificial colours, flavours or sweeteners. Does not contain lactose, salt, alcohol, fat or yeast. Wellbaby Multi-vitamin Drops has not been tested on animals. 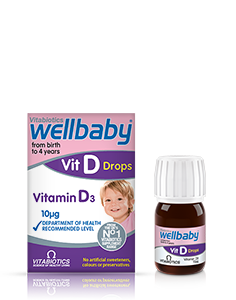 Wellbaby Multi-vitamin Drops is available from Boots, independent pharmacies and health stores. Alternatively you may shop online. Granulated Raw Cane Sugar, Purified Water, Malt Extract Liquid (from Barley), Vitamin C (Sodium Ascorbate), Ferric Ammonium Citrate (Green), L-Lysine Monohydrochloride, Acidity Regulators: Sodium Hydroxide, Sodium Citrate and Citric Acid Monohydrate, Zinc Sulphate, Propylene Glycol, Niacin (Nicotinamide), Vitamin E (DL-Alpha Tocopheryl Acetate), Thickener: Xanthan Gum, Preservative: Potassium Sorbate, Orange Oil Extract, Pantothenic Acid (D-Panthenol), Vitamin A (Palmitate, Antioxidant: DL-Alpha Tocopherol), Riboflavin (5'-Phosphate Sodium), Vitamin B6 (Pyridoxine HCl), Thiamin (Vitamin B1 as Hydrochloride), Folic Acid (as Pteroylmonoglutamic Acid), Vitamin D3 (Cholecalciferol), Biotin, Vitamin B12 (Cyanocobalamin).Allergy Advice: For allergens, including cereals containing gluten, see ingredients in bold. 0.5ml as marked on the syringe, taken twice daily. Do not give more than the recommended amount. 1. Insert syringe into bottle, then hold upside down. 2. Draw out 0.5ml liquid as marked on syringe. 3. Carefully administer drops onto baby's tongue. Rinse clean and dry syringe after use. Do not use in steam steriliser. SHAKE WELL BEFORE USE. SYRINGE INCLUDED. See pack for full information and directions for use. As with other food supplements, seek professional advice if your child is under medical supervision, has epilepsy, haemochromatosis, suffers from food allergies or are allergic to any of the ingredients. Allergy Advice: For allergens, see ingredients in bold on carton base. This product contains iron, which if taken in excess may be harmful to very young children. Avoid contact with clothing and fabrics which may stain. Keep tightly closed and store below 25°C in a dry place, out of sight and reach of children. Once opened store in fridge and use within 3 months. Why is it that babies and children may benefit from nutritional supplements? How much liquid does Wellbaby Multi-vitamin Drops contain? How and when should Wellbaby Multi-vitamin Drops be taken? Are there any undesired effects whilst taking Wellbaby Multi-vitamin Drops? Is Wellbaby Multi-vitamin Drops suitable for vegetarians? Has Wellbaby Multi-vitamin Drops been tested on animals? Government surveys have indicated that some infants are not getting enough of certain nutrients such as iron, zinc and vitamin D. Once a child is old enough to consume solids, parents often face the challenge of getting young children to eat a healthy diet ideally rich in fruit and vegetables. Some foods may have a lower than expected nutritional content and be low in certain micronutrients as a result of several factors including modern farming practices, the lengthy storage of ‘fresh’ food before it is sold in some shops and over cooking which can cause certain nutrients to breakdown. It is important to promote a healthy diet and lifestyle in younger children as the starting point of good health and encourage positive eating and exercise habits for later in life. "My baby absolutely loves these vitamin drops. She has her mouth open for them as soon as she sees the packaging! Due to breastfeeding after 6 months because she will not have formula, I give her these to make up for her not receiving added vitamins in milk. They last a long time and are great value for money." "I had taken Pregnacare when I was pregnant with my son and the doctor who delivered him remarked that he had never seen such an alert baby! When he was old enough, I gave him WellBaby drops and now that he is 4 years old, I give him the WellKid Jelly Pastilles. He absolutely loves the taste and always looks forward to taking his vitamins. My son is bilingual, and is growing up healthy and strong and everyone comments on how fast he picks up things. Thank you very much for worldwide shipping!" Always read the product directions before use. Do not exceed the recommended intake. As with other food supplements, seek professional advice if your child is under medical supervision or suffers from food allergies. Vitamin supplements are not intended to treat or prevent any disease. Food supplements must not replace a balanced and varied diet, and a healthy lifestyle. A baby's skin can be very sensitive. Any spillage should be wiped away on contact. In rare cases, infants with particular sensitivity may experience mild temporary redness of the skin after accidental contact. If this occurs, as a precaution you should discontinue further use.